The 2016 Olympic games in Rio will be one of the biggest events in the sporting calendar. The city is blessed with great weather, long meandering beaches, and an infectious party atmosphere. If you are lucky enough to be attending, here are 20 things to do in Rio while at the Olympics. 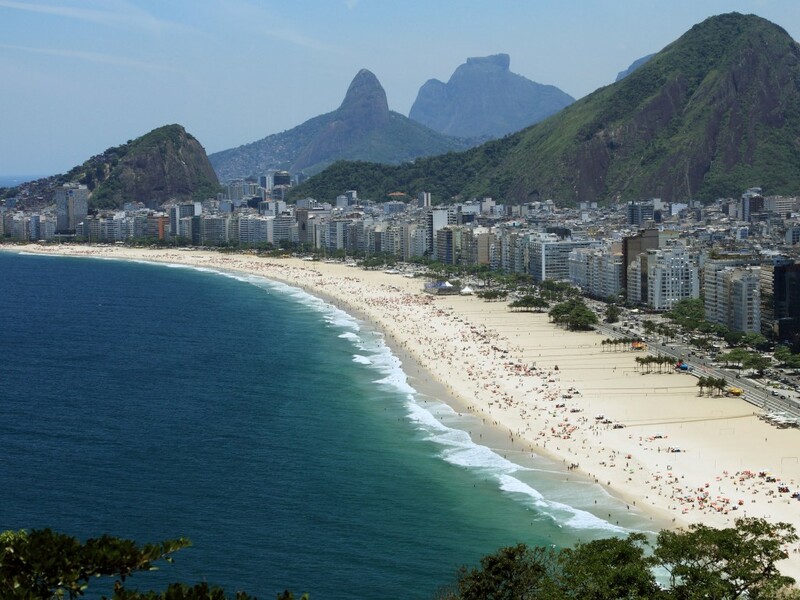 There are many beautiful beaches in the world but none can compare with the vibrant atmosphere of Copacabana Beach. Running 4 kilometres along the side of downtown Rio, it’s always full of happy, fun-loving locals. Here you will be able to relax in the sun, take part in an array of sporting activities, or simply sample the delights of local restaurants. Overlooking the city from the summit of Corcovado, Christ the Redeemer is an imposing and stunning statue. Made from reinforced concrete and sandstone, it stands 130 ft. tall. On a clear day, the views are breathtaking and it should be one of the first places you visit upon arrival in Rio. For those who enjoy the nocturnal life, Rio Scenarium is for you. The premier nightspot is famous for its Samba, as well as a wide range of antiques on display throughout its three floors. If you are looking to slow the pace down a little, take a stroll through Parque Lage. Situated at the base of Floresta da Tijuca, it offers English-style gardens and picturesque lakes. It is a quiet place to relax and enjoy a coffee or meal. 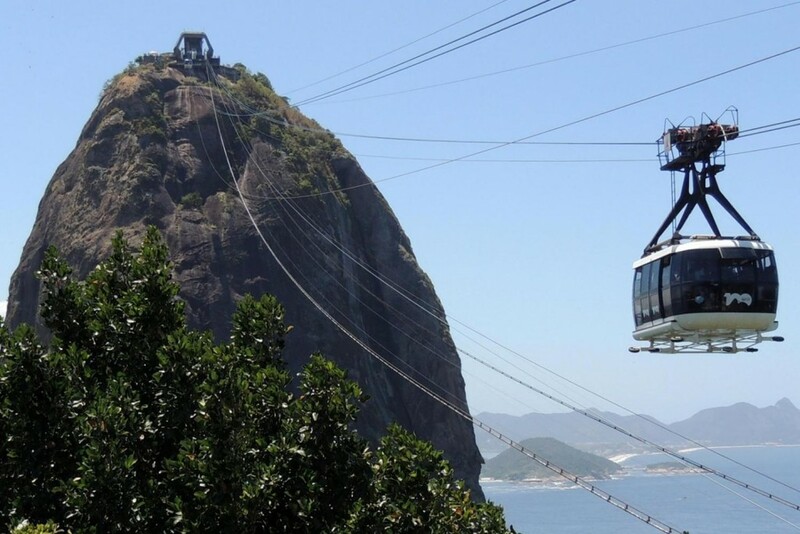 Sugar Loaf Mountain is an iconic destination giving you panoramic views of Rio. If you have a head for heights, then you can travel up on one of the many cable cars. With a stop halfway up, you’ll be able to see views of Guanabara Bay and the Rio-Niteroi Bridge. Covering 32 square kilometres, Tijuca National Park is the largest urban rainforest in the world. When you hit the summit, you’ll be greeted with spectacular views; and it’s the ideal place for hikers. There is plenty of local wildlife on show, including ocelots and howler monkeys. If you are an art lover, you mustn’t miss the opportunity to visit Escadaria Selaron. The famous brightly coloured steps are the creation of Chilean-born artist Jorge Selaron, who covered the steps in colourful mosaics. If you’re looking to escape the city for the day, then Ilha de Paqueta is the perfect destination. There is a relaxing ambience, and with no cars on the island, transport is by foot. The locals are welcoming and the scenery is befitting of the location. The zoo in Rio is situated at Quinta da Boa Vista, and for animal lovers is the place to be. With a huge variety of mammals, birds and reptiles all indigenous to Brazil, the zoo features a large walk-through aviary. 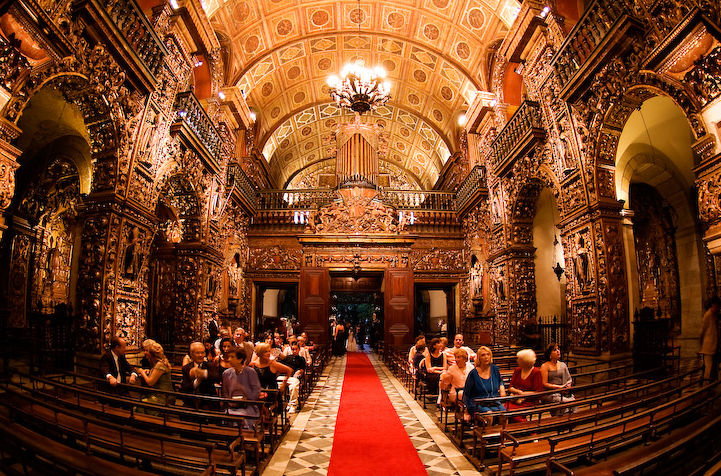 With such a religious heritage, visiting one of Rio’s many churches is a must. Mosteiro de Sao Bento is known for having excellent views over the city. The interior is decorated in gold and is filled with a number of historical treasures. The high mass on a Sunday includes a choir of Benedictine monks singing Gregorian chants. If you know where to look, Rio can be a great place to grab a bargain. There are many boutique shops about, particularly in the areas of Ipanema and Copacabana. For the savvy shopper, head downtown to the indoor markets at Uruguaiana and the shops in the area known as Saara. Venturing back into Rio’s nightlife, the Fosfobox is a club hidden beneath a shopping centre and is near to the metro. The club plays a wide variety of music, from modern day to funk and glam rock. If you want to combine great music with a great view, then head to The Maze. Situated inside one of the local favelas, this tiny house hosts regular Jazz nights and is always packed with locals and tourists. If you are looking for quality music and a great bar, make sure this is on your list. No trip to Brazil would be complete without a visit to the Maracanã Stadium, particularly if you can get inside for either a tour or a live football match. It will be the venue for the opening ceremony of the 2016 Olympics and, with such a rich history, is certainly one for avid sports fans. If you love the theatre, the Theatro Municipal is a must-see. The stunning building is located in the city centre and is the home of Rio’s opera, ballet and orchestra. The best way to experience the building and amazing architecture is with a 45-minute guided tour. If you’re visiting a country for the first time, it is always nice to learn about the history. The Museu Historico Nacional is the best place to do this. It contains relics that are important to Brazil’s history, from its founding to the early days of the republic. Another one for beach lovers. 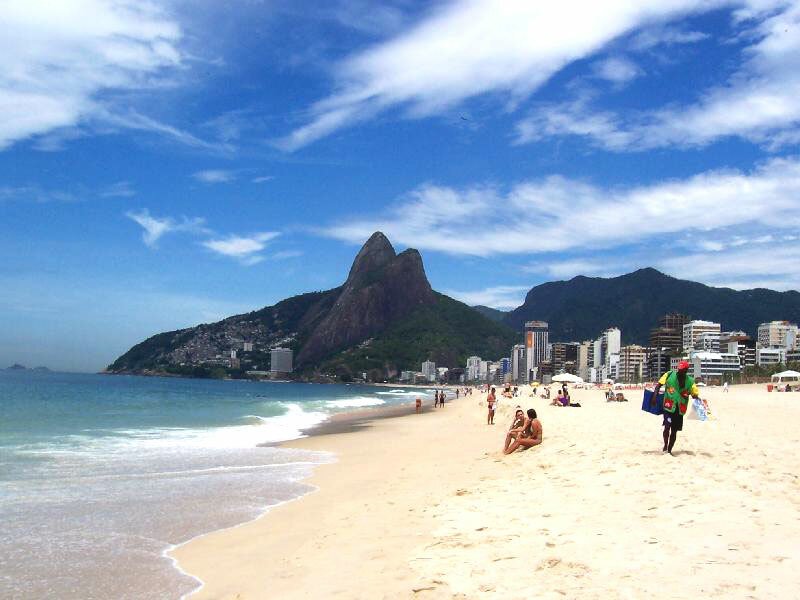 If you enjoyed the splendour of the Copacabana, Ipanema shouldn’t disappoint either. If you are a keen surfer, you’ve come to the right place; in between Ipanema and Copacabana lies Arpoador, Rio’s popular surfing location. Just be careful of the strong undertow. Also home to the large gay community in Rio. The adrenaline junkies will not want to miss Rioxtreme. 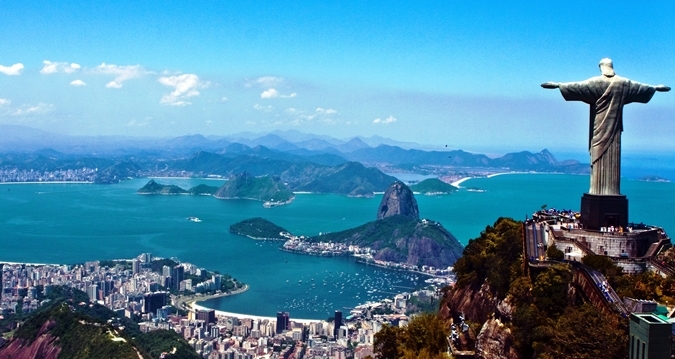 Experience Rio from an aerial viewpoint by paragliding or hang-gliding over it. Taking off from a ramp in the Tijuca Forest, you will have views of the coast and Pedra da Gavea, before touching down 20 minutes later on Pepino Beach. Wonder at the incredible architecture of the Rio de Janeiro Cathedral. It can be found in the city centre and features four beautiful rectilinear stained glass windows, which run from floor to ceiling. Finish off your trip to Rio in style and treat yourself to a little pampering at the Copacabana Palace Spa. Here you will be able to relax and enjoy a massage or beauty treatment. It will be well deserved if you’ve managed everything on this list! 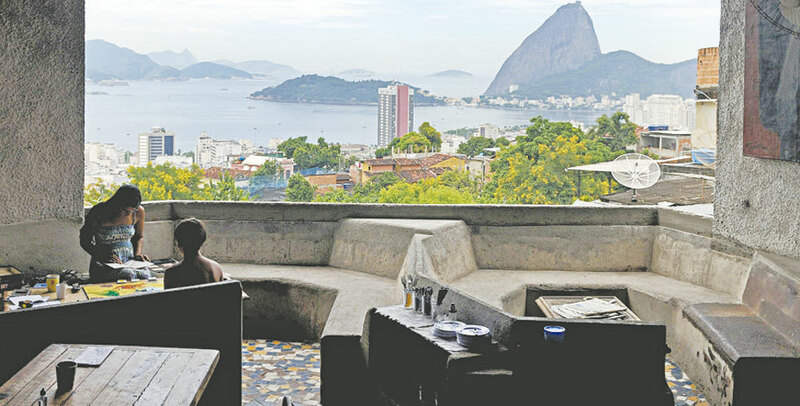 Rio has some amazing hotels to offer, from 5* boutiques to great little hostels in the favelas. 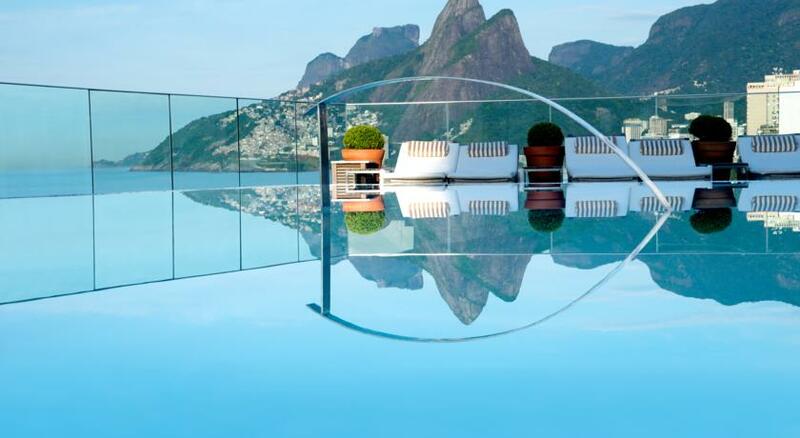 I’ve previously stayed at Hotel Fasano Rio de Janeiro which I highly recommend, mainly for it’s killer-view rooftop (see below). The hotel is set in the exclusive area of Zona Zul, close to all the main attractions Ipanema beach and the area feels very safe. Great roundup of things to do and places to see. Most of the visitors for the Olympics will be in Rio for the first time. They will need great inspiration for things to do when they are not at the Olympic events. I’d pull up a chair, shoot a video and laze the day away. Brazil is beautiful. On a side note, can’t believe the Games are almost here. Thanks for the fabulous pictures and inspired list. Signing off from not so sunny NYC. Nice post, I live in Mexico right now but always wanted to visit Rio. Is the Copacabana beach where they were in The Fast And Furios? Not sure, but you have some awesome beaches in Mexico. I love Tulum!! I have been to Tulum once. Nice place, and tons of iguanas where the ruins are! I can confirm it. Tulum is a place you have to visit. Some nice Boutique hotels on the beach, Yoga retreats and budget bungalows. I always wanted to go to Rio. and in these Olympics I’m coming to RIO. Thanks for posting this. Now I know what I can do after the Olympics. Thanks again. Friends brought some great place from Rio during the Olympics. They said they had difficult time finding accommodation. Well, I’m looking forward to some quiet neighborhood to stay and visit places in this list. Thank you. hii nice work on Rio . Thanks for sharing this information with us i am happy to know about the Rio many thing from your blog.